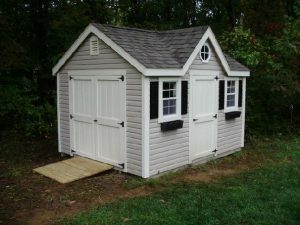 Our vinyl sided sheds are 100% maintenance free. 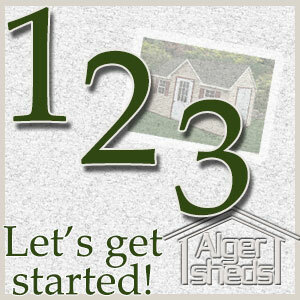 You have a choice of 11 different vinyl colors and 14 different colors for the wood sided sheds. Pick your style (Cape Cod, A-Frame, Lean-To, Quaker, Dutch Barn, Barn, or Mini barn), pick your siding (vinyl or Duratemp ENGINEERED siding), pick your color scheme for the walls, trim, and shingles, and then sit back and let us build your shed to order. LISTED BELOW ARE THE STANDARD SPECIFICATIONS FOR OUR SHEDS. 2″x4″ spaced 16″OC. For vinyl sided sheds, 1/2 CDX plywood is used for sheathing covered with vinyl siding. For wood siding, we use Duratemp brand engineered lumber siding. 2″4″ spaced 16″O.C. sheathed with 1/2 CDX, drip edge, fascia and soffit wrapped in aluminum and 30 year architectural laminate shingles over tar paper. WINDOWS: 2 functional (sliding) 18 x 27″ windows with screens and shutters. BUILT ON SITE BY OUR OWN LOCAL EMPLOYEES – NO SUBCONTRACTORS!